Again, kubik has been appointed as a partner to assist PUMA Ocean Racing in their event and retail activities during the Volvo Ocean Race. 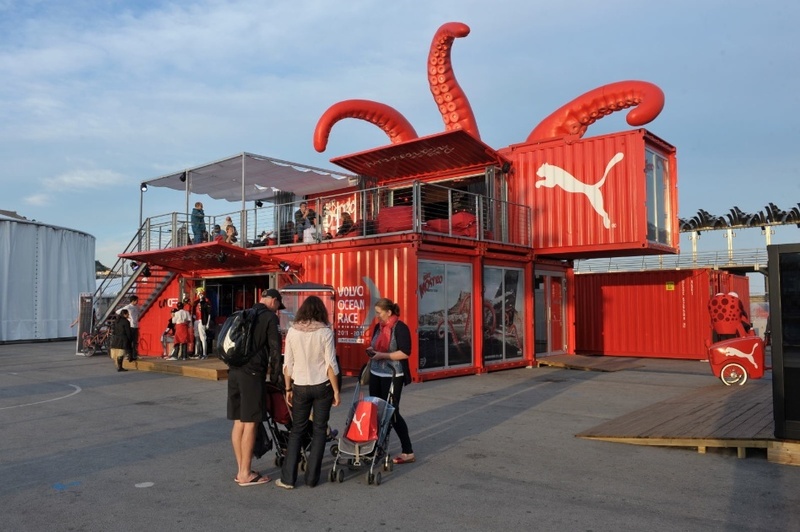 Based on kubik’s experience in the previous editions of the race, and in co-operation with PUMA Event Retail, the concept of the mobile PUMA Retail Store is now fully fine-tuned: PUMA Quad is an easy-to-install temporary setting consisting of four forty foot sea containers operating as a true PUMA Retail Store. To capture everyone’s attention, larger-than-life Mar Mostro tentacles reach out from the top of the containers setup. kubik designed a tailor-made interior retail system which offers the PUMA retail team full flexibility to design the interior of the store to their specific needs. The system is based on strong materials such as flight cases that are able to withstand the rough conditions of traveling all over the world. These basic units can be adjusted in a unique way, presenting a full range of PUMA Ocean Racing gear, in an attractive setting. Inside also offers a Social Media feature allowing visitors to pose while holding the steering wheel of PUMA’s boat, while Mar Mostro is trying to get on board in the background. This picture can be sent to friends via e-mail and shared on social media sites like Facebook.